Sturgeon Lake, near where the town of Valleyview exists today, was a favoured fishing and hunting base for First Nations people, first for their own food supply and later for supplying the fur trade posts around Lesser Slave Lake with meat and furs. The land was inhabited first by the Beaver First Nation. They were joined by the Cree, and after 1870 by an influx of Metis of various ethnic origins, including Cree, Iroquois and Assiniboine. The first fur trade post at Sturgeon Lake was established by the Hudson's Bay Company in 1877. By 1879, when George Dawson came through the area via an established Indian trail across the Wapiti and Smoky Rivers, a settlement had been establised there with a few log homes and several gardens containing barley, potatoes, turnips, carrots, beets and onions. The settlement increased substantially in the early 1880s and by the time the NWMP conducted their first inspection tour in 1897, there were about 40 homes and 4 fur trade posts, including the Hudson's Bay Company compound of shop, fish house and factor's home. After Treaty No. 8 was signed in 1899, Sturgeon Lake Indian Reserve #54s was established beside the Lake. Sturgeon Lake Settlement was surveyed in 1907, with lake-front property granted to the HBC, the RNWMP, the Roman Catholic Mission and Revillon Freres Trading Co. Metis families living in the settlement prior to 1907 were also granted 40 acres each. 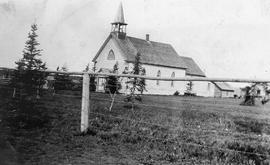 That same year, the Residential School was established at St. Xavier Mission on the lake shore. The Oblate fathers had been visiting the area since 1884, and built a church in 1905. They also added a Mission Farm on the south-east shore of the lake, where they produced grains, garden crops and raised livestock. 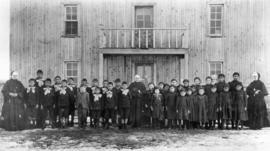 The Residential School accepted day students, such as the Kerr and Williamson children, as well as the Metis and First Nations children. Metis families, such as Eli and Eva Badger and their two sons, Paul and Dan, were among the area's first settlers. They were experts at building log cabins, craftwork such as snowshoes, and gardening. They raised the first crops, about 1905, on the land which became the Valleyview townsite and supplied hay for travelers coming in over the Edson Trail in 1911. Paul's wife was known to be the area's midwife. In 1916 the first European homesteaders, such as Dan McMillar began to arrive, with the Williamsons and Adolphsons coming in 1918. Some land was settled through Soldiers Settlement Board after World War I, but the main influx of settlers began to arrive in the late 1920s. The community's first post office opened in 1929 along with the Red Willow Creek Store. It was with the renaming of the post office and store that Red Willow Creek became "Valleyview." Also in 1929, the Calais School District was organized, and in the summer of 1930 the first resident nurse, Jessie Hyde, arrived. A temporary nurse residence and office-dispensary was set up in David Williamson's original homestead cabin. Later in the 1930s a new home and office for Nurse Hyde was built. The initial medical fees were along the following lines: house-calls $1.00, visit to the office $0.50, and maternity care (including pre- and postnatal care) $10.00. Fishing, hunting and trapping remained prodominent in the Valleyview area, where there were bear, moose, martin, fox and beaver whose furs were valuable. Traditionally in the First Nation and Metis communities, women were in charge of preparing fish, activities which included cleaning, frying, and smoking fish, saving them for months to come. In the 1930s a major winter commercial fishery was developed at Sturgeon Lake. The fish market was based on supplying eastern Canadian and American markets with whitefish, which were considered as the finest whitefish in Alberta. In the 1950s this market disappeared with the establishment of inspection proceedures and the Federal Fish Marketing Board. Sawmills were another source of jobs and income. Burrough's Mill operated north of Sturgeon Lake operated with a crew of fifty men, and supplied lumber for the High Prairie market as well as their own. Also, Sturgeon Lake continued to be a focal point for the Valleyview area. As early as 1920, there were "resorts" and cabins for rent around the lake to provide for recreational time. By 1949 Valleyview was expanding with the completion of a new ten room hotel, a beer parlour, and a restaurant. In September, 1950, the Pacific Petroleum Company stuck oil about seven miles north-east of the tiny hamlet. As a result of the discovery, Valleyview boomed. In only one year, 1955, the community went from hamlet to village to town status. The photographs were gathered by Mary Ellen MacGregor for the "Journey to the Millennium" collection sponsored by the Valleyview and District Chamber of Commerce. Digitized images of the privately owned photographs were donated to the Grande Prairie Regional Archives in 2003. This fonds consists of 463 digitized photographs, 210 digitized documents and research regarding the history of the Valleyview and Sturgeon Lake areas. A binder containing research text and scanned copies of photographs, articles and maps acts as the finding aid. The digitized documents are 210 pages of a 1910 Revillon Freres Trading Post Counter Book, preserved by the Williamson family who ran the post.